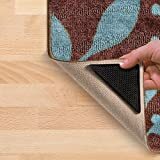 Keeps rugs and mats in place to prevent slips and trips. 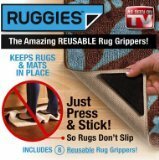 RUGGIES SET OF 8 ADHESIVE REUSABLE RUG GRIPPERS NON SLIP GRIPS MAT ANTI FLOOR FAST DELIVERY ! ! ! ! !. 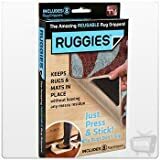 Press and stick Ruggies triangles around edges or corners of any rug or mat to prevent curled corners, bunches, slips, and trips. include 8 adhesive sticker + 8 Rug Pad. Grip rugs so that they do not slip. For use on all types of floors- hardwood, tile and linoleum. Reusable- just wash with soap and water to renew grippers. Encourages young readers to explores objects and concepts such as storms, faces, parties, jungles, battles, tears, movement, and time, and explains how great artists used these themes to create their works.